This premium system contains some of the best components money can buy. These clients had us install a 960W solar charging system with a 600Ah lithium battery bank, and a 3000VA inverter. They live full time in their RV, and now they can enjoy some of the same comforts of a grid connected home while on the road. Living off-grid is much easier with a powerful system like this. 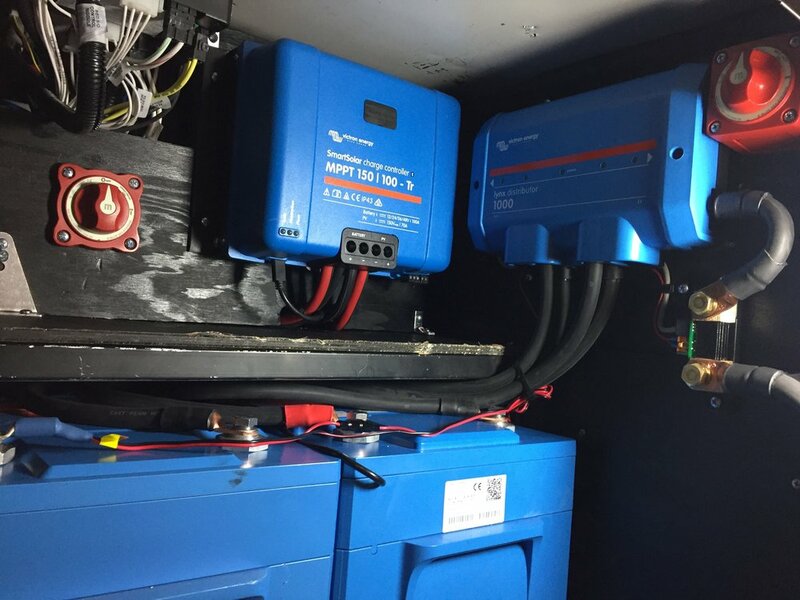 One decision our clients have to make when setting up their RVs with solar power is what kind of battery bank they want. Lifeline AGM batteries are very popular for this type of application, but we also offer Lithium batteries, which are the latest and greatest battery technology. 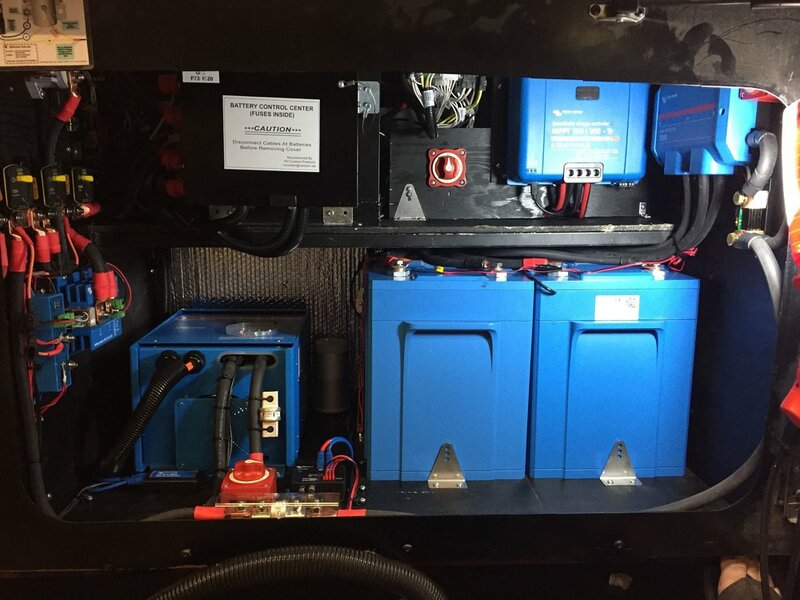 For this client we installed an 800Ah 12V Lifeline AGM battery bank. A comparable lithium system would have cost over $6000, while this client paid around $2200 for their AGMs. This is a very powerful system for someone who doesn’t want to spend the additional money on a Lithium system. 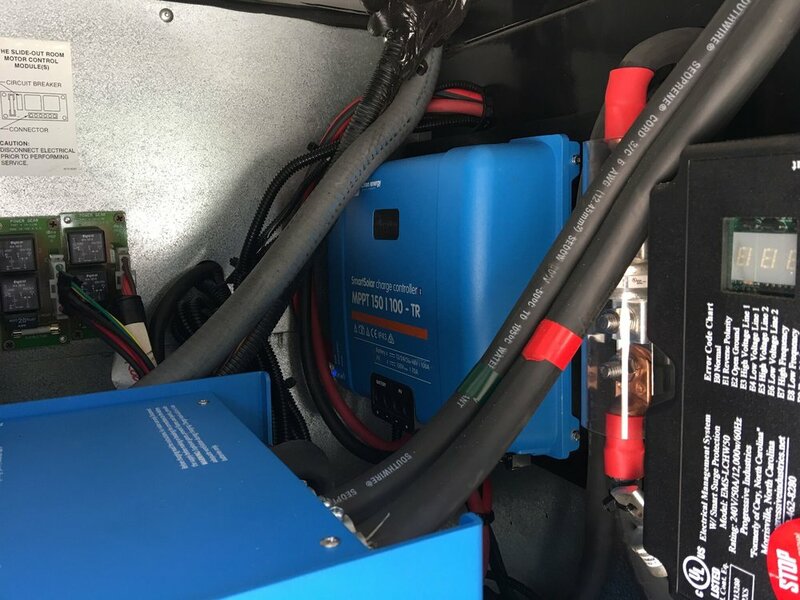 This client won’t be able to run their air conditioner ALL the time, but they will be able to do a couple hours per day with the 1280W solar charging kit, 3000W inverter and 600Ah lithium battery system. This rig had a simple solar charging system installed. With 480W they should be able to keep their batteries topped off while running a refrigerator and lights. This customer came to us with a variety of electrical issues, the most troublesome being that their inverter/charger wasn’t working correctly. We upgraded their 1000W inverter to a 2000W pure sine model and replaced some burnt relays. We also installed a 320W solar charging system. Camping will be much more comfortable now.